Be ready to witness the historic union of legends to salute a game that's nothing short of a religion - Cricket. The World Cup winning captains who will be part of the daylong event are - Clive Lloyd, 1975 & 1979 Champion, Kapil Dev, 1983 Champion, Allan Border, 1987 Champion, Imran Khan, 1992 Champion, Arjuna Ranatunga, 1996 Champion, Steve Waugh, 1999 Champion, Ricky Ponting, 2003 & 2007 Champion. 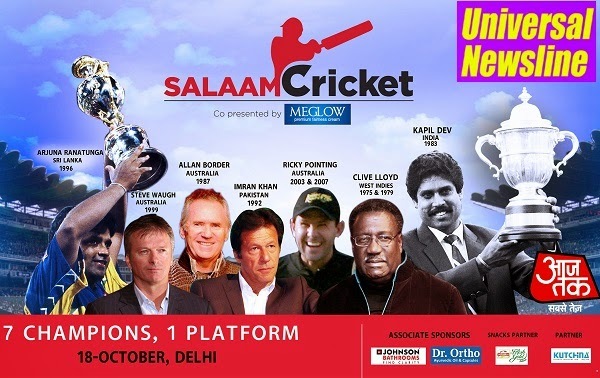 The greatest Indian Captains including Sinil Gavaskar, Saurav Ganguly, Bishen Singh Bedi, Mohammed Azharuddin and Ajay Jadeja will also be part of the event. Key members of the Indian World Cup winning squad including Yuvraj Singh, Harbhajan Singh, Piyush Chawla and Ashish Nehra will be among the many superstars who will take centre stage. The day will start with session - “Winning the World Cup – Start of a Revolution” by world cup winning captains- Kapil Dev & Clive Lloyd. This will be followed by the session “Thunder Down Under” addressed by the former Australian World Cup Winning Captains- Allan Border, Steve Waugh and Ricking Ponting. The next session will have Yuvraj Singh sharing his thoughts in – Story of a Winner. A special session will also see Indian Cricketers rom the 2011 World Cup squad – Yuvraj Singh, Harbhajan Singh, Ashish Nehra and Piyush Chawla wishing the Indian Team for the upcoming World Cup. Emotions will run high around the session- India V/s Pak which will witness former Indian and Pakistan captains like- Sourav Ganguly, Kapil Dev, Mohammad Azharuddin, Ajay Jadeja, Inzmam-Ul-Haq & Aamer Sohail discussing the excitement and the high expectations when the two cricketing rivals go on to play. The day will close with the World Cup winning captains sharing the stage in the “Seven Wonders: All WC Winning Captains on One Platform”. The session will have Clive Lloyd, Kapil Dev, Allan Border, Imran Khan, Arjuna Ranatunga, Steve Waugh & Ricky Ponting sharing their views.